I've been an iOS-first user for nearly three years now, and during that time there have been very few tasks that required me to pull out my old MacBook Air. One remaining holdout has been downloading music or podcast files from the web and saving them somewhere I can conveniently access them on iOS. The ideal scenario would enable importing those files into iTunes, where they get added to my iCloud Music Library – unfortunately, that remains impossible on iOS today. But the next-best option I've discovered can be found in an iPhone app called Doppler. Doppler launched a few months ago as a music app aimed at the non-streaming market. Despite the increasing popularity of services like Apple Music and Spotify, there are still plenty of users who want greater ownership of their music library, and that's where Doppler comes in. It specializes in offline playback and custom library curation. 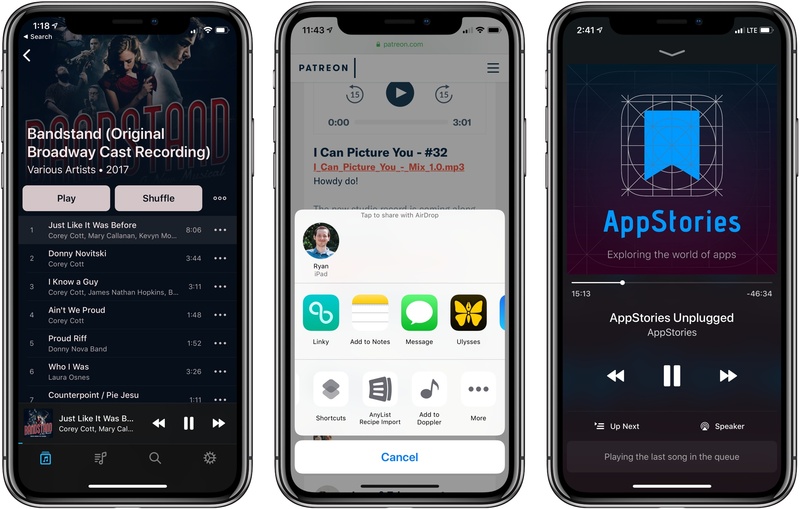 You can import your existing iTunes purchases, or import songs or podcasts saved in the Files app, and customize metadata so your library's organized exactly as you like it. Today in version 1.2, Doppler adds a feature I've long wanted on iOS: the ability to import files directly from Safari. My main use cases for Doppler's new feature include downloading MP3 tracks from an artist I support on Patreon, and downloading special members-only podcasts, like AppStories Unplugged from Club MacStories. In both cases, getting the audio files from Safari into a music player, or even just a cloud storage provider, has historically been way too difficult on iOS. Last year when iOS 11 introduced the Files app, I thought this problem would finally be taken care of; surely I'd be able to use Files' share extension from Safari to save the audio tracks. Unfortunately, Safari only presents the Files extension when downloading certain file types, and audio files aren't included. And that's where Doppler comes in. Doppler now offers an action extension that can be used in two contexts: either when an audio file is already loaded in Safari, or even just when long-pressing a link to an audio file and hitting the 'Share...' option. The action extension then pulls in the file, lets you modify track metadata, and saves it to your Doppler library. The app is billed as a music player, but this same process works well for podcasts too – just know that due to their increased track size, podcasts will take longer to import. Doppler is still a young app, so it's missing key features that will hopefully be added in the future, such as an iPad app and iCloud sync. Its design is solid though – I like how it evokes past versions of Apple's Music app with backgrounds matching the color scheme of each album. Despite being feature-light, Doppler works well as a basic music player for your non-streaming service needs. And now, thanks to its Safari import feature, it's become a crucial utility that's staying installed on my device. Doppler is available for iPhone on the App Store.